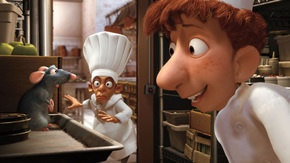 In the new animated-adventure, RATATOUILLE, a rat named Remy dreams of becoming a great French chef despite his family’s wishes and the obvious problem of being a rat in a decidedly rodent-phobic profession. When fate places Remy in the sewers of Paris, he finds himself ideally situated beneath a restaurant made famous by his culinary hero, Auguste Gusteau. Despite the apparent dangers of being an unlikely - and certainly unwanted - visitor in the kitchen of a fine French restaurant, Remy’s passion for cooking soon sets into motion a hilarious and exciting rat race that turns the culinary world of Paris upside down. Like a restaurant out to attract customers, that is the bold statement we shall put upfront for this latest Pixar Animation Studios offering. And this is definitely one of the most memorable cinematic treat you’d be served this year, simply because it has got all the right ingredients. After 2004’s The Incredibles, director Brad Bird returns with a story with so much heart and soul, you’d be a scrooge not to like it. 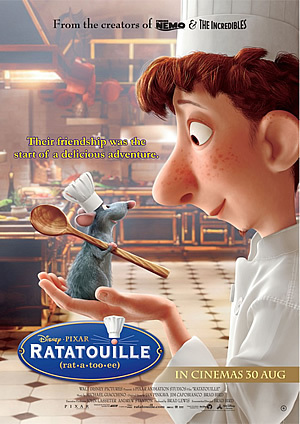 Remy is a rat (how apt, to think that the House of Mouse is actually presenting a Pixar film about a rat) that has, well, the nose for good food. When Linguini, an out-of-luck lad who needs to keep his job in a restaurant chances upon the rodent, the two pair up to concoct the most delectable dishes anyone has tasted. And like all well-meaning movies, this 110-minute picture explores themes like family, friendship, and ah, the love for food. For the kids, they will be left enthralled by the adorable rats (though it gets a little scary when you see a kitchen full of them), the amusing Linguini and his hilarious body antics, the colorful animation and the many spot-on comic setups. For the Moms and Dads, be assured you’d be similarly enchanted by the flawless computer generated characters, the jolly music score by Michael Giachinno, the clever dialogue and most importantly, the engaging story that will appeal to both young and old. Pixar fans can also have one hell of a time identifying in-jokes from its past award-winning productions. Voicing Remy is Virginia-born TV actor Patton Oswalt, and he brings the needed warmth and depth to an animal character that could have easily fall into the trap of convenient caricature (read: cute without depth). Elsewhere, there’s Lou Ramano’s dorky Linguini, Ian Holm’s (LOTR, The Day After Tomorrow) sneaky cook and Janeane Garofalo’s (The Truth About Cats and Dogs, The Wild) fiery turn as a female cook. But the most delightful performance comes from veteran actor and multiple Oscar nominee Peter O’ Toole (Troy, Venus), who brings to life the emotions of a miserable and mean-spirited food critic. Watch out for the character’s final voiceover – thanks to technology which makes his facial expressions so movingly real, and coupled with O’ Toole’s affecting tonal voice, we daresay it’ll touch and melt any Scrooge’s heart. After the movie, you’d fall in love with Paris, you’d fall in love with food, and most notably, you’d fall in love with the magic of animation.